Home Tedd Arnold Fly High, Fly Guy! Title: Fly High, Fly Guy! Hardcover. Pub Date: 2008 Pages: 30 Publisher: Cartwheel Books The fifth book in an award-winning easy-to-read series about a boy and his pet fly the each book in the series has a fun foil cover! Mom and Dad won't let Fly Guy go along on the family road trip. They're afraid he'll get lost. But when Dad accidentally shuts him in the trunk. Fly Guy goes along for the ride! First. Fly Guy gets lost at the picnic site - but he shows up in the garbage can. Then he gets lost at the art museum. but he shows up as part of a modern painting. At the beach. he turns up in a shell. and at he amusement park. on Buzz's hot dog (yuck!). Zany illustrations and easy-to-read text make this a fun reading adventure for the beginner. 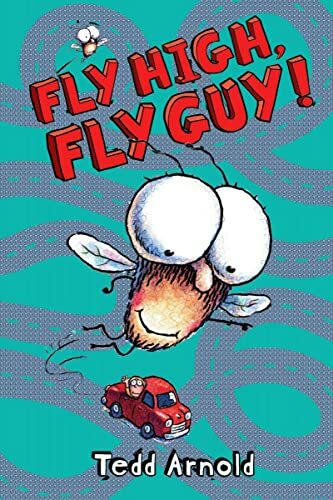 The first book in the Fly Guy series is a Theodor Geisel honor book.